It’s difficult to imagine a world without the advantages of electricity! We use it every day, without thinking. Sometimes we forget small children are unaware of the dangers of electricity. Concerned parents know that babyproofing all areas in which toddlers roam is critical. Babies learn through exploration but there are dangers throughout the home. It’s our job to keep these youngsters safe until they can understand the hazards in their world. The early years of mobility for a baby are possibly the most dangerous time. Pre-k children may begin to grasp the concept of danger and electricity, but for ages 2-5, babyproofing is essential. It’s a simple process: Get down on your hands and knees and crawl through the house. You’ll get a “baby’s-eye-view” of the world and can spot dangers. Look for and make note of electrical outlets, power strips, extension cords, hanging cords, and cords that are never unplugged. 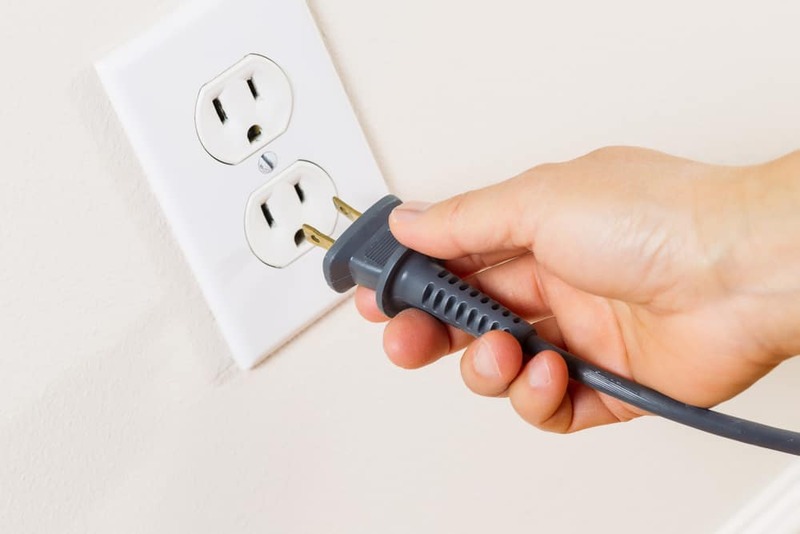 These are your electrical babyproofing targets: electrical outlets, extension cords, power strips, television, unplugging. Regular electrical outlet receptacle – The vertical slots are open; these need babyproofing. Tamper-resistant receptacles – The vertical slots have a plastic covering which only opens when they are pushed simultaneously. The letters “TR” should be engraved above the slots. Standard or Decora style – You must know this before you purchase outlet babyproofing caps. Standard styles have a screw between the two outlets. Decora styles are one piece. Extension cords should be temporary. Simply remove the child from the area when using an extension cord. They look good to chew, toddlers can trip over them, and they’re fun to tug, bringing whatever they’re plugged into down to the floor. If you need additional electrical outlets, the safe thing to do is have your local electrical contractor install what you need. The computer or entertainment area may have power strips for multiple electrical processes. These are usually on the floor; your baby’s favorite terrain for exploration. For the plugged-in outlets, you can purchase a childproof power strip cover. It slides over the power strip, protecting the outlets but allowing the cords to hang out. We know the difference between a television and an interactive toy, but babies don’t. First, remove all loose objects near the television. DVDs/DVD covers, remote controls, game controls, gaming devices – these are enticements for a developing toddler. Ten children die each year due to falling televisions. Televisions are top-heavy, so secure the television to the wall. (This is a great time to buy the wall-mounted flat-screen you’ve wanted.) Use TV anchors for shelf-top television units. Your local, Phoenix-area electrician cares about safety for your family. If you have any questions or concerns about babyproofing your home, contact Turn It On Electric. Ask us if an electrical assessment is a good idea for your property. Turn It On Electric is LEED (Leadership in Energy and Environmental Design) certified. What this means is we care about the environment – and your children’s future. We strive to find alternative solutions to promote sustainable energy.